PITTSBURGH, Pa.: Even Spencer Lee, winner of two Junior World Freestyle Championships and an NCAA title, gets rattled. You can’t blame him. Lee admitted Friday night that when Oklahoma State’s Nick Piccininni stuck him in a dual meet a month ago, it was tough to get over. Of course, it’s the first time he had been pinned since he was nine years old. But like other great athletes, the type that doesn’t come along very often, Lee got over it. He put it behind him and focused on the next goal, which was winning another NCAA Division I title. 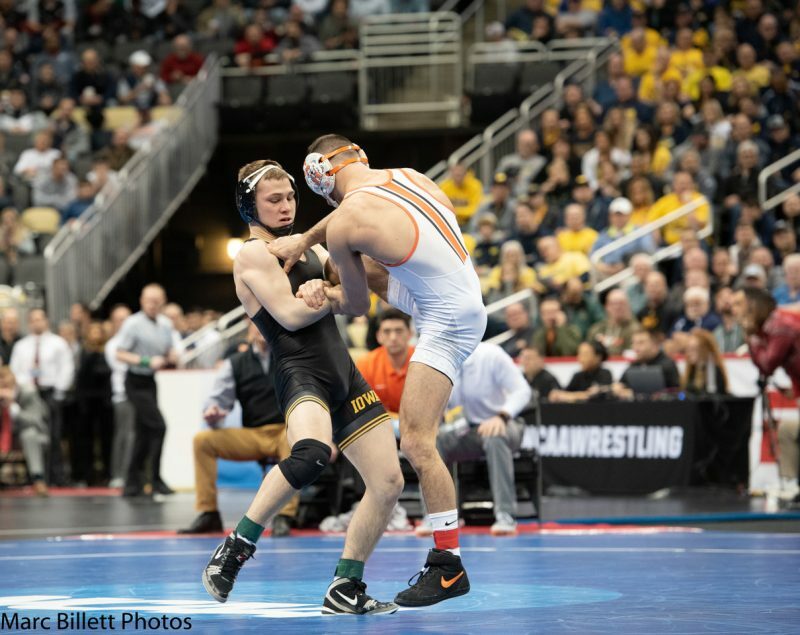 Lee took a huge step forward in the PPG Paints Arena Friday night, when he avenged his loss to Piccininni, putting together a workmanlike and impressive 11-4 in the NCAA Division I Wrestling Championship semifinal round. “I think the last time I was pinned was the PJW State Finals … Colin Cronin, yeah, give him a shout out,” Lee smiled. “I was nine, so it was hard for me to be able to get over that. Continued Lee, “Props to Nick. He’s a great opponent. He packed me in front of his home crowd. I think it was a record crowd for Oklahoma State. They have a great environment. It’s electrical. Obviously, it’s not like the NCAA Tournament, but they do a great job. This wasn’t about revenge for Lee, at least he didn’t point to it in his post-match press conference. The wrestler in the singlet was irrelevant … It was just another person in the way of the ultimate goal of winning a title. Lee came out firing in the first, scoring a takedown along the edge 43 seconds into the match. He racked up 1:07 in riding time before Piccininni escaped to close the gap to 2-1 heading to the second. The pace suited Lee. He escaped off bottom 44 seconds into the second and added another takedown along the edge 17 seconds later to take control of the match and up his lead to 5-1. Piccininni didn’t get rattled. He got the crowd stirring with a reversal with 43 seconds left in the period. But, Lee stole the momentum back with :01 on the clock with an escape to lead 6-3. “I just focused on the next score,” Lee said. “I couldn’t dwell upon how I felt or how he felt or what the clock was ticking down to or whatever. I didn’t know how much time was left when I went out there. Lee did that and more. Piccininni started on bottom, but he struggled to shake lose. Lee, known for his ability on top, rode his opponent for 1:26 before allowing an escape. From there, Lee continued to press the issue. He earned a takedown with :03 on the clock and added near-fall points for the 11-4 decision. “Well, I mean, I really don’t, at this point it’s the National Tournament,” said Lee when asked if this rematch victory meant more. “You can only wrestle who they put in front of you. It just so happened to be a rematch. Lee moves on to the finals for the second straight year, and he will have to take out Virginia’s Jack Mueller to earn a second straight NCAA title. Mueller is no slouch. He blew by top seed Sebastian Rivera, who beat Lee twice this year, in an 8-2 surprise. “It’s going to take my entire heart,” said Mueller when asked what it will take to beat Lee. “Realizing I have a whole group of family, friends, coaches, teammates lifting me up every step of the way.